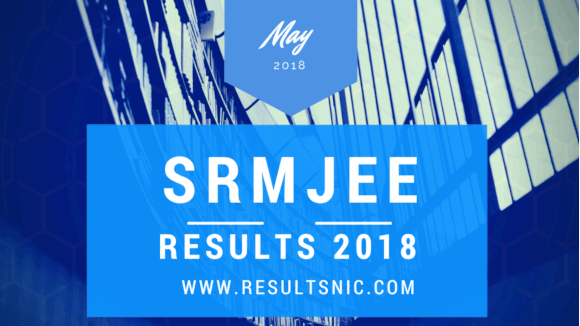 SRMJEE Result 2018: SRM University released the SRMJEE Result 2018 on the official website srmuniv.ac.in. Candidates who appeared on SRM University JEE Examination can check their results now. To log in to the official website, a candidate must have the email address and password. The SRM University will not send the result through post or any other medium. On the basis of the rank in the exam, seats will be allocated to the candidates. It will lead to the login portal. There. the candidates will have to enter e-mail id/phone number and password. The SRMJEEE examination was conducted by SRM University for admission to BTech programmes from April 16 to 30, 2018. Students who have qualified the SRMJEEE will become eligible for admission into SRM University Haryana, SRM University Andhra Pradesh and four other campuses of SRM Institute of Science and Technology (SRMIST) for the coming academic year. There are a number of relevant documents which candidates will be required to carry at the time of counselling, which included —Call letter, SRMJEE 2018 rank card, admit card, mark sheet of class 10th as proof of date of birth, mark sheet of class 12th or its equivalent, photo ID proof , cancelled cheque leaf. At the time of counseling, candidates will need to pay Rs 2,10,000 (Registration fee of Rs 10,000 and part of first-year tuition fee). SRM also offers direct admission and scholarship in order to encourage students of exemplary talent. They are offered to first rank students and all the central and state Boards in India, top 1000 rankers in each district of Tamil Nadu and exemplary sportspersons at national and international level. The counseling schedule for applicants who have chosen SRM University - NCR Sonepat Haryana is given below. The counseling schedule for applicants who have chosen SRM University - AP, Amaravati is given below. The counseling schedule for applicants seeking admission in SRM Institute of Science and Technology (SRMIST) – All Campuses (NCR Campus Modi Nagar Gaziabhad, Vadapalani, Ramapuram , Kattankulathur campus) is given below. Candidates who have missed out attending the counseling at SRM University - NCR Sonepat, Haryana and SRM University- AP, Amaravati can also attend the counseling at Kattankulathur as per the rank order on the date and time scheduled above. Provisional Allotment Letter will be issued only upon payment of Rs. 2,10,000/- (includes Registration Fee of Rs. 10,000/- and Part of the first year *tuition Fee). Candidates are strongly recommended to pay the above amount before coming to the counseling, through E-Pay facility. Payment information on E -pay is made available in the applicant dashboard. NO OTHER MODE OF PAYMENT (Cash / Cheque) WILL BE ACCEPTED. 7. Canceled cheque leaf with the name of the Candidate/Parent/Grand Parent printed. After payment of Rs. 2,10,000/- during counseling and receiving the Provisional Allotment Letter (PAL), the balance tuition fee, if any, must be paid on or before June 05, 2018, failing which the admission will stand canceled and the vacancy arising out of such cancellations will be filled immediately from the waitlist. If the annual tuition fee for a particular programme/institution is less than Rs. 2,10,000/- the excess amount would be adjusted in hostel/bus fees.